Five years ago, my wife and I lost our second child to miscarriage. Seventeen days later, I wrote a post entitled "Heartbreak." I haven't written anything longer than a Facebook status update or reply on the subject in the years since, but that should not be misconstrued as willfully ignoring the loss or trying to gloss over it. The pain today is more muted than immediately following the loss, but, as I suspected then, one never truly "gets over" such a significant loss. In the five years between then and now, there are plenty of stories to tell, such as how my wife and I suffered when month after month passed and every pregnancy test came back negative. How we remained committed to having another child, despite trying for over a year with no success. How my older daughter told me that there was "a baby in mommy's tummy" during a routine call on the drive home. How my wife and I prepared for the worst when she started spotting again during the third pregnancy. How we waited in the emergency room waiting room for what felt like ages while we waited to find out if our child was alive or dead. How I burst into tears of joy to hear a fetal heartbeat that proved the baby was alive. How my stomach sank when my wife told me to call an ambulance when the pain of contractions knocked her to her knees. How we celebrated together approximately 30 minutes later when we welcomed our new child in to the world in the back of an ambulance parked one mile from our home. We are tremendously blessed to have two beautiful, smart, strong-willed daughters. Though parenting is exhausting work, it is also richly rewarding and I do not take this opportunity for granted. These children are a blessing from God and I cherish them, even on days when they're especially demanding. By the grace of God, I remained true to my pledge to not abandon my faith, though that resolve demanded much. I wish I could say I had spent my youth building a foundation of study of the Bible and spiritual disciplines such a regular prayer to prepare me for such a devastating loss. Though I squandered so much time in adolescence and adulthood, God held firm to me while I worked through my grief. I am immensely grateful He continues to do so. Though there were days I wish He'd let me go, I am so very glad He did not relent. Work and family responsibilities demand I write shorter pieces on those very rare occasions when I do write, but I will close by once again giving all credit for my ability to persevere to God. In my own strength, I would have turned away from the suffering instead of working through it. I can't imagine enduring the emotional torment that my wife and I–and every couple trying to conceive after a miscarriage–faced before our younger daughter was born without supernatural aid. I pray I can at the very least encourage someone by telling my story, even in fragments spaced five years apart. If nothing else, I remain committed to respecting the life that was lost as well as the lives of our two daughters to whom we strive to show even a dim representation of God's abounding love. But I'm hoping to upload at least a few soon. My wife had a miscarriage Sunday, July 1. The days leading up to the miscarriage were terrifying. The days following the loss were devastating. My wife and I prayed fervently when she started spotting. We wept together when it was clear that the child was lost. I experienced anger, resentment, terror, confusion, grief, and a whirlwind of other terrible emotions. I do not understand why this horrible tragedy took place. I can not make sense of it, no matter how hard I try. I have a strong tendency to attempt to conjure satisfactory explanations for the trials and tribulations of my life, but I could find no reason sufficient to justify the loss of an unborn human life. I could find reason in mature Christians, strong in the faith, suffering cancer and dying young, all the while glorifying God, but I could not and can not find reason in this. Nevertheless, I privately pledged when I first learned my wife was pregnant that I would not turn away from my faith should the worst come to pass. The pledge would be impossible to keep in my own strength. Left to my own self apart from the strength of God, I would likely throw myself wholly into any available distraction to drown out the pain; I would look away from the excruciating question of God's sovereignty in the suffering of believers. I confess I did all those things and fear I will do them again. If there was no God, if I were simply an assembly of random particles, if there was no design and no Designer, then what would be left after such an earth-shattering loss than despair, distraction, or madness? I know that I will continue to wonder if some sin of mine cost my unborn child his or her life. There are days since the miscarriage when I suspect and fear and almost certainly know that if I would have not done something I should not have or done something that I should have that the child would have been born safely. In my more lucid moments, I dismiss the theory, but, unless God should intervene, I will suffer the doubts for years to come. It may be that Prosperity Gospel and triumphalism dug its roots into me deeper than I once suspected. It may be that Satan or demons are hard at work to drive me to a crippling guilt. It may be that there is merit to this admittedly terrifying suspicion. I can not yet say anything with certainty and I suspect it may be years or even a lifetime before these tormenting questions are answered with finality and authority. Despite my doubts, I have chosen to hold firm to my faith in the sovereignty of God. I still believe He is omnipotent; He could have saved my child's life if He chose to. I still believe He is still a just God, as Scripture says. And I still believe He loves me. Certainly, to one who has not recognized one's own sinful nature, repented, and accepted God's gift of salvation, such talk must sound like madness or wishful thinking. Those who share my faith in a great God will understand such belief is anything but foolishness. What hope can we, as Christians, offer a suffering world if we ourselves do not suffer? How can we expect to point people to Christ through what we do and who we are if we only follow Christ in times of prosperity and joy? What value is a belief that crumbles at the first hint of opposition? I grieve for the loss of my unborn child. A precious human life was lost and nothing I do can rewind time or save that life. Nothing I did and nothing I said was powerful enough to prevent my wife's miscarriage. I have often said that "control is an illusion," though I never wanted to be so wrong as the Saturday before my wife miscarried. I stubbornly hoped there was something I could do or say to ensure my wife carried the child to term. I do not expect to wake up one day and be "over it." There are days where I can carry on, business more or less as usual, my co-workers and others oblivious to the tragedy my wife and I endured and are enduring, and put it out of my mind for a while. Yet there are moments when I feel I can hardly breathe and I can only choke back tears by fear of the embarrassment of crying publicly. More than once I have remembered C.S. Lewis writing, "I never knew grief felt so much like fear." In the days following my wife's miscarriage, it was sometimes difficult to hold my daughter without crying because she has been and continues to be such a precious gift. I often told my wife, "This child's awesome. I want another." And I still do. I have not given up on giving my daughter a little brother or sister and ask for your prayers that, if it is the Lord's will, that my wife's next pregnancy would go smoothly and lead to a healthy full-term baby. Following the miscarriage, in my selfishness, I desired to remain silent. I did not want to hear words of comfort when I knew no human could provide lasting comfort. I did not want to share a matter so deeply personal, especially since I tend to be a very private person. Yet more than that, I desired to honor the life that was lost and, even more importantly, glorify the God that has saved me from the penalty of sin, is saving me from the power of sin, and will one day save me from the presence of sin. I pray I will never have to experience such loss again, but I also seek to submit to God's will for my life. I also pray for others who have experienced the same loss and offer what must seem like such a paltry consolation: To pray with you when I myself still struggle daily to work through my grief. Know that you are not alone and do not turn away from a God who still loves you in the face of suffering. I speak to myself as much as, if not more than, I speak to any other. In closing, I would like to point anyone else experiencing suffering or loss to the message Suffering in the Believer's Life by Alistair Begg. The message has helped me in my attempt to keep my focus on Scripture and the Author of the Word through this terrible time. I have never known Begg to "tickle the ears" of his listeners, instead preaching the Word of God with authority and clarity, and this message is no exception. I’ve seen at least 3 of these 4 codes previously (possibly all 4; my memory fails me) when dealing with a recurring issue: My speedometer would sporadically not activate (for lack of a better word) when driving. The issue started occurring more frequently until I finally took it to a mechanic, who gave me two options: A quick but likely temporary fix at a lower cost or a more expensive but permanent fix. I opted for the less expensive fix and didn’t experience the issue again for several months. I started having the same issue again recently (speedometer not activating), but smacking the dashboard directly above the speedometer would sometimes temporarily force the speedometer to work again. I haven’t noticed the car handling any differently and haven’t had the speedometer issue in the last week or so, but I’m concerned that the AutoZone employee found 4 trouble codes. I’m not that concerned about driving around town, but I sometimes visit family out of town and I don’t want to take my Maxima on the highway without first knowing that it’s safe. As for many others in this economy (and terrible, terrible job market), money is tight right now, so I don’t want to spend more than absolutely necessary to resolve these issues once and for all; however, I also don’t want to neglect my or my family’s safety. What would you all advise? I wanted to thank everyone for their wonderful gifts this year. I heard at least one family member express a desire to know how my wife and I spent our gift money, which reminded me to post how I spent the gift money I received last Christmas (2009) and on my birthday earlier this year. Click past the break for a list of items I purchased with gift money this last year. While Gamestop may not be my favorite company, I have to give credit where credit is due: Today’s Dragon Quest IX event was much more fun than anticipated. More people attended than I expected, most of the attendees were adults, and the children that attended were all very well-behaved. I didn’t attend all 4 hours of the events, but the time I did spend there was very enjoyable. I had wondered how Dragon Quest IX’s Tag Mode would see any use in America. Now I know. While most Americans are highly unlikely to come across any other DS owners with DQIX in Tag Mode during their travels, “magnet” events such as this can be surprisingly successful, even in smaller metropolitan areas. If you missed today’s event, don’t worry: There will be another DQIX event at Best Buy locations next Saturday (August 7) from 12 p.m. to 4 p.m. And if you don’t already own a copy, you can purchase Dragon Quest IX from Amazon.com for $34.99 with free Super Saver shipping. While reading the story of Joseph in Genesis today, I found myself angered when the chief butler forgot Joseph for two years (Genesis 40:23). No other element of the story is as aggravating: Jacob making public show of favoritism toward Joseph, Joseph’s adolescent error in sharing his dream with his brothers, the other sons of Jacob plotting to kill Joseph, Reuben’s frustrated plot to hide Joseph then sneak him back to Jacob, the sons of Jacob lying to their father about his favorite son’s fate, Joseph’s enslavement, and Joseph’s imprisonment for false accusations. None of them evoke the anger toward a man restored to prominence and who forgets an act of divine and personal benevolence for two years. Car trouble: Caused by rusted muffler? A few weeks ago, I was in my car and pulling out of my apartment complex when I thought I heard an airplane flying overhead. I soon realized my car was making the sound, but only when first accelerating. Once the car reached approximately 25 mph, the noise stopped. I thought the issue might be low tire air pressure, so I checked my tires. Air pressure was normal. I thought the issue might be a part dragging on the ground. When my car was stopped, I looked underneath and nothing seemed to be hanging low. The sound has continued up until 25 mph for the last few weeks, but today, when pulling out of another parking lot, my car made an awful high-pitched squeal. The sounds stopped a minute later, but the experience was unsettling and the rumbling sound from before persisted while below a certain speed. Is it likely a rusted muffler is the culprit? If so, what would be the least expensive (yet still safe) solution? I’ve been unemployed for the better part of two years and the job I work now only lasts until the project ends. UPDATE: I took my car to a local auto repair shop and, while my muffler indeed looks rough, it is not leaking. The problem causing the awful sounds is instead with the rear brakes. It doesn’t take a mechanic to know that’s not good. This is very bad news as the ballpark estimate for repairing the issue is considerably more than the cost of installing a new muffler. Futurama: The Complete Collection is on sale for $85 USD (list price: $199.98 USD) shipped on Amazon today (Thursday, March 11, 2010). 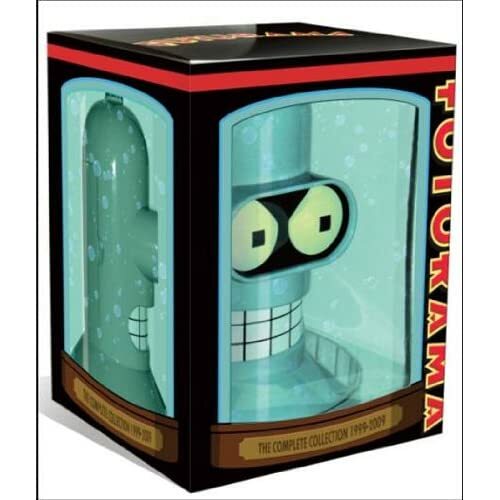 The pack includes all episodes of the Futurama television series, all four Futurama movies, and a collectible Bender head. I may have to break down and finally spend some of the Christmas gift money I’ve been hoarding. Update: HUZZAH! Just ordered the Collection from Amazon a few minutes ago.